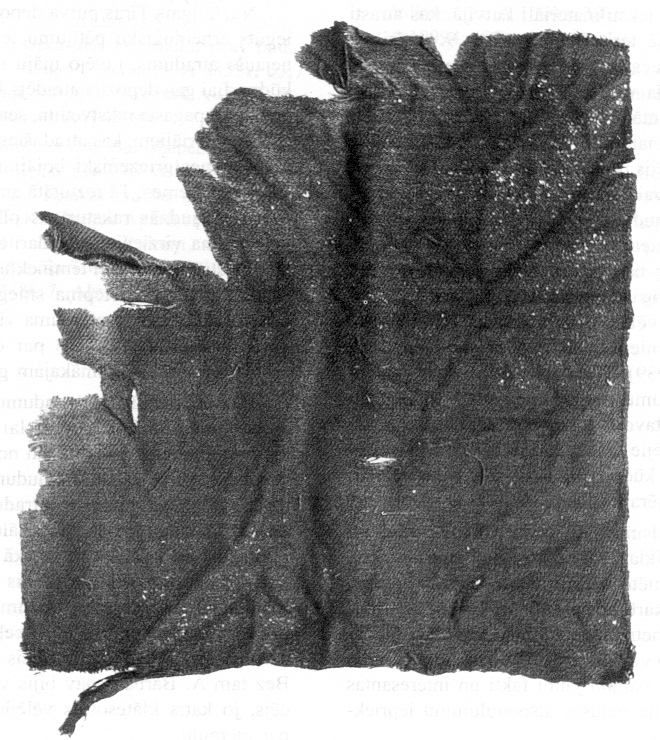 The Tirā cloak is almost complete, although it was torn in many pieces (Figure 1) by mechanical peat digging when discovered in 1936. It is rectangular, 210 cm (warp) by 110 cm (weft), made of dark blue wool twill. It was woven to shape - the short edges are tablet woven braids, representing starting and finishing borders. One long edge is a selvedge, the other has been hemmed. It seems to have been part of a hoard deposited in the bog (in the 9th century, based on the associated artefacts). Some other partial garments were discovered, together they are thought to represent the male dress of the local Curonian branch of the Baltic tribes . 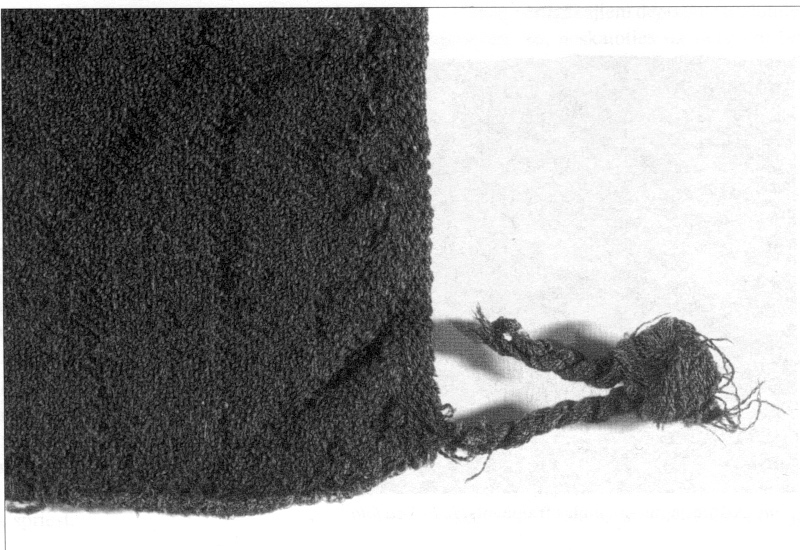 Figure 1 - One corner of the Tirā cloak (the reinforced selvedge is probably on the right). The weave is a slightly unbalanced 2/2 diagonal twill of fine quality, with 16 warp threads and 12 weft threads per centimetre. The warp threads are two-ply, 0.5 mm thick, S-plied from Z-spun yarn. There are two types of weft thread, they are similar - single, 0.75 mm diameter - but they have opposite spins. They are changed after each four passes, forming narrow stripes (spin-patterning) . It is noted that both wefts are inserted from the same side of the weave (see also below). Figure 2 - Detail of finishing border, viewed from reverse side - loose warp ends are turned back through the tablet woven border, forming a fringe which is not visible on the outside of the cloak. It is stated  that the cards are rotated one quarter-turn after every passage of the weft (= main warp thread). It seems unlikely that 16 sheds could be done per cm. It seems more probable to me that the threads were doubled, possibly by pulling a long loop from the main warp spool through each shed: see also the picture of the finishing border (Figure 2) which supports a requirement for only 8 sheds per cm. One long edge is a reinforced selvedge. It is about 7 mm wide (Figure 3). It is described as a repp or ribbed weave (?warp-faced tabby). To balance the tablet braid in the corner cords (see below), it probably contains 16 warp threads. As already mentioned, the weft is formed from two threads with opposite spins, that alternate every four sheds. My reading  is unclear about how the two wefts are changed, but as noted, the wefts always change on the same edge. To avoid having to end off a weft thread every time the other weft is used, it is likely that the intervening four sheds were just skipped, leaving small loops of free yarn at the selvedge. That might account for the slightly rippling appearance of this edge (Figure 3), or they might have been changed on the other (now hemmed) edge. Figure 3 - Detail of corner. 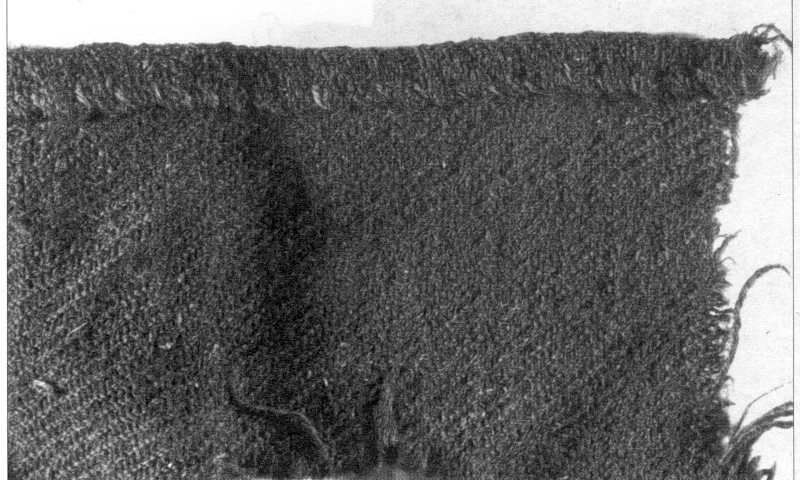 The ribbed, reinforced selvedge is on the right, a tablet woven border (damaged or partly visible) below. Threads from both of these are plied into cords. The ends of the two cords are knotted together, forming a loop and tassel, but one side of this loop has torn free from the cloak. The other long edge is hemmed (Figure 4). 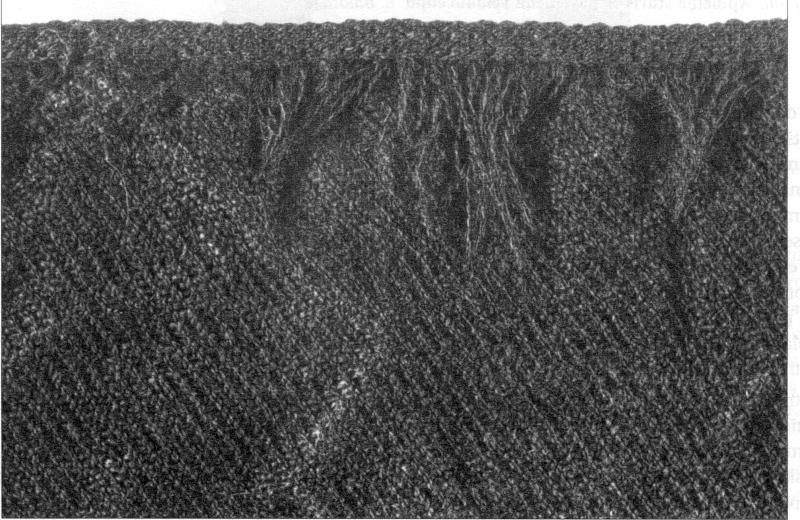 This was probably the bottom edge of the cloak, and it might be the edge from which the two alternating weft systems are introduced (see above). I guess the selvedge on this side no longer exists, because the edge needs to be hemmed - perhaps the weaving was originally wider. The hem is folded twice and estimated 10-11 mm wide. It is fastened with normal hem stitch in a light coloured, two-ply (2Z->S) woolen thread. The stitch interval is ~6 mm. Figure 4 - Detail of hemmed edge, viewed from reverse side. Note hem stitches in lighter coloured thread - this is the only sewing on the entire cloak. On two of the corners the threads from the selvedge and the threads from the tablet-woven border are plied/twisted into cords. The ends of these cords are then knotted together, forming a small (~40 mm long) loop with a tassel (Figure 3). I suppose that originally loops may have also decorated the other two corners, but these were lost when one edge was cut off and hemmed (see above). Despite their simple appearance cloaks are a challenge to reproduce at any more than a superficial level of accuracy, as they are normally untailored garments - taken from the loom in a single piece with no cut-and-sewn edges. The information on this page was gathered to commission a woven reconstruction of the Tirā cloak, and it is hoped that comments from the weaver can be added here as the project progresses. L. Bender Jørgensen. North European Textiles until AD 1000. Aarhus University Press: Aarhus 1992. V. Ģinters. 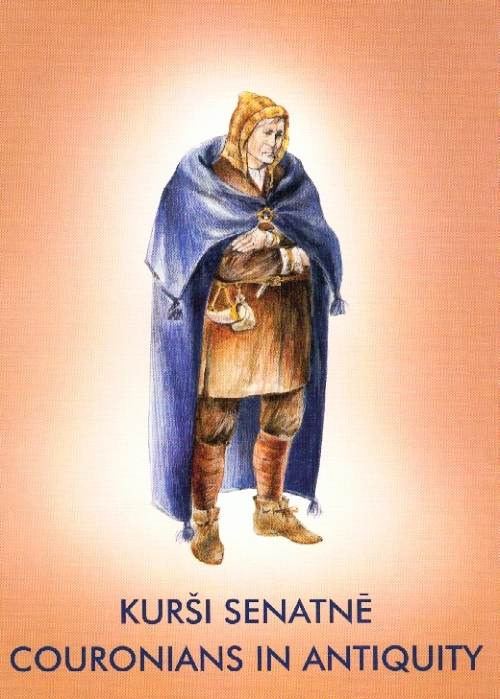 Tracht und Schmuck in Birka und im ostbaltischen Raum (Antikvariskt arkiv, 70). KVHAA: Stockholm, 1981. I. Stašulāne (ed.). Kurši senatnē (Couronians in antiquity). LNVM: Riga, 2008 (in particular, p.101-107: Couronian archaeological textile finds). I. Ţeiere (2008). Par Tīras purva depozīta tekstilmateriāliem. Pētījumi kuršu senatnē: Rakstu krājums. (LNVM Zinātniskie raksti, 14). Arheoloģija: Rīga, p.129-138. V. Urtāns (1964). Latvijas 5.-9. gs. deposīti. Arheoloģija un Etnografija, 6, p.39ff. Riga. V. Urtāns. Senākie deposīti Latvijā (līdz 1200. g). Zinātne: Riga, 1977. I. Žeiere (2013). Fragments of male dress from a 9th-century bog hoard in Latvia. In: J. Banck-Burgess & C. Nübold (eds. ), North European Symposium for Archaeological Textiles, 11 (NESAT XI). VML: Rahden/Westfalen, p.187-192. Cloak from Tirā bog, Latvia, written and webbed by Peter Beatson. (c) Birka Traders 2011-14. Not to be copied without permission. All rights to materials in any linked pages belong to their respective owners.